Need something to read while drinking your coffee? Caroline Davis from the Maths Promotion Unit told us that today's Guardian Education Supplement is a bumper issue for maths: explaining how maths is taking over the streets, an analysis of why applications for STEM subjects is still and issue, and how Recursive Binary Sequences of Differences can help you pour the perfect cup of coffee…. Blast it like Beckham — what tactics should a soccer player use when taking a penalty kick? On the ball — if your team scores first in a football match, how likely is it to win? Power trip — how long do football managers last? You can forget the spuds, as the far more important math/maths debate may finally be settled with Peter Rowlett's new Math/Maths Podcast: 5136 miles of mathematics. It's a conversation about mathematics between the UK and USA. Peter in Nottingham calls Samuel Hansen in Las Vegas and the pair chat about math and maths that has been in the news, that they've noticed and that has happened to them. The latest episode talks about something close to everyone's hears (or ears) — just why are those vuvuzelas at the world cup sound so annoying. They also discuss putting relativity to the test, the Game of Life and taking maths to the streets. 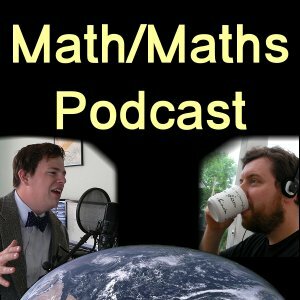 Listen to the latest episodes of Math/Maths Podcast, Travels in a mathematical world and watch the latest History of Maths and X. Our sister site NRICH is celebrating the connections between maths and art with a special issue containing hands-on activities, challenges and articles to get your creative juices flowing. We particularly like the painting by functions challenge, which invites you to imitate computer graphic artists by representing your favourite image using mathematical shapes and functions. But there's lots of other stuff too, from celtic knots to origami. There are activities for all age and ability ranges — why not have a look? We've all struggled with knots. As anyone who owns an MP3 player or mobile phone knows, anything but the most careful winding of the headphone cord or power cable can result in a hopeless mess of tangles. Knots are more than simple irritations, they can actually pose a threat to life. A single knot can reduce the breaking strength of climbing rope by up to 50%. Spontaneous knot formation in umbilical cords can quadruple the risk of fetal mortality. Spontaneous knotting in DNA leads to faulty gene transcription and an increase in the rate of potentially dangerous mutations. Despite this, remarkably little is known about the formation of knots — or how to prevent them. This is why the University of Aston is proposing a mass experiment to fill in some of the gaps in the science of knots and address a mathematical conjecture. Researchers are looking for groups of keen students in schools who want to involve themselves in active data gathering and interpretation and to contribute to a genuine piece of novel science. Your school's involvement and effort need not be extensive. The experiment can be carried out in school, in a class environment, with minimal resources (several lengths of string), and typically involving an hour or so per week for two or three weeks. It could form part of a national curriculum case study in Key Stage 3 or 4 to use mathematics to solve problems, or as an open ended mathematical investigation. The results of this major experiment will be announced at an open public talk at the forthcoming British Science Festival hosted at Aston University in September 2010. If you are interested, please register by contacting the Knot Experiment Coordinator, Vicky Bond by email (v.j.bond@aston.ac.uk) or post (The Knot Experiment, Aston University, Aston Triangle, Birmingham B4 7ET). Martin Gardner, champion of recreational mathematics, died on Saturday the 22nd of May, aged 95. Gardner delved into recreational maths in the 1950s when he started writing his Mathematical games column for the Scientific American, which he kept up for 25 years. Many books resulted from his passion for mathematical puzzles and brainteasers, but he also wrote extensively on other subjects, producing annotated versions of Alice in wonderland and Through the lookinglass, debunkings of pseudoscientific myths, religion, and also tried his hand at fiction. He'll be sadly missed by puzzlers around the world.